Radiance of the Seas is home to nearly every signature dining experience the line offers -- effectively doubling passengers' culinary options. These are so varied, it's sometimes hard to decide which restaurant to visit for dinner, but the fees charged by many of the venues might help you sort that out. For many cruisers, the decision comes down to how much extra they want to spend onboard in addition to their cruise fare. However, given the quality of meals in the main dining room, there is no need to spend any extra if you don't wish to. Vegetarian and gluten-free options are always available in the main dining rooms and identified on the dinner menu. Health-conscious passengers can also opt for Vitality selections, which are marked on the menu and have less than 30 percent of calories derived from fat. If you have specific dietary needs, discuss them with the maitre d' before your first meal, or ask specific questions about the items you select. In the specialty restaurants, dishes are not marked vegetarian or gluten-free so diners with dietary requirements need to ask their waiter. Cascades Main Dining Rooms (Decks 4 and 5): The main dining room, Cascades, is an elegant, two-level restaurant featuring a grand staircase, columns and, true to its name, a cascading waterfall. Service by the smiling international staff is attentive, and despite the massive space with seating for 1,110 passengers, the dining experience still takes on an intimate feel, particularly at dinner, when many passengers skip the main dining room in favour of the buffet or specialty restaurants. Breakfast is served daily from 7.30 to 9 a.m. (or 8 to 9.30 a.m. on sea days) and includes coffee and juice, fresh fruit, cereal, yoghurt, pancakes, eggs a few ways, bacon, sausages and hash browns. Lunch is available on sea days only from 11.30 a.m. to 1 p.m. with a changing daily menu that includes dishes such as Vietnamese fried rice, BLT, tandoori chicken, or fish and chips. Burgers, soup and salad are also always available. Desserts range from Swiss plum tart or bread and butter pudding to ice cream, or sliced fruit. At dinner passengers can choose between assigned seating, early (5:30 p.m.) or late (8 p.m.) or My Time Dining in which you pick a preferred mealtime (between 6 and 9:30 p.m.), but can change your reservations on a daily basis or simply walk in when you're hungry. Dinner is a daily changing multicourse menu with starters such as crispy coconut shrimp, roasted beets and orange salad, or baked French onion soup. Main meals include braised Australian lamb shank, pappardelle carbonara, roast chicken or vegetable korma with desserts such as pavlova or creme brulee providing a sweet finish. Windjammer Cafe (Deck 11): This casual restaurant serves buffet-style meals, with a choice of indoor and outdoor seating, for breakfast, lunch and dinner. It closes between meals (usually a half-hour between breakfast and lunch, and three hours between lunch and dinner). Breakfast includes options such as eggs, sausages, bacon, pastries, cereal and fruit. Lunch and dinner offerings are similar, with a choice of pizzas, pastas and stews. In the evening, there is always a themed food station such as Chinese or American, which changes daily. This buffet is popular throughout the day, including dinner when many passengers opt for a casual bite here instead of the more formal main dining room; a testament to the variety and quality of the meals on offer at the Windjammer. The only downside is the popular restaurant can get a little crowded at breakfast, especially on port days when passengers are getting off the ship early to join excursions. Park Cafe (Deck 11): Inside Radiance's solarium you will find Park Cafe, a pleasant alternative to the bustling Windjammer Cafe. Egg and bacon muffins, yoghurt cups, fruit salad and more are available for breakfast, while salads, panini sandwiches, soups and the like hit the spot from late morning to 6 p.m. Late-night snacks, such as pizza, are served here from 9 p.m. until midnight daily. Boardwalk Doghouse (Deck 11): Grab a gourmet hot dog or burger to enjoy on the pool deck, with a choice of condiments, sides and salads. Room Service: The only complimentary room service offered on Radiance of the Seas is a basic continental breakfast, which includes choices such as croissants, cereal, muffins, juice, and coffee or tea. Other options include a menu of sandwiches, burgers, soup, pizzas, salads and desserts such as New York cheesecake and chocolate cake. These don't cost anything but a delivery charge of US$7.95 applies to each order. Suite passengers are not required to pay the room service delivery fee. Cafe Latte-tudes (Deck 5); a la carte pricing: This coffee bar serves up specialty a la carte coffees and sweet treats, like cookies and cakes. Coffees are priced from US$3 and the food is complimentary. 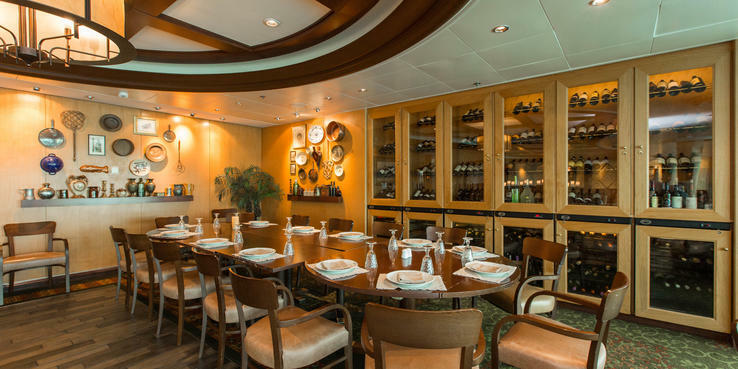 Chef's Table (Deck 6); US$100: This elegant affair takes place in a private dining room with a dozen other food lovers. If your group is large enough, there is no reason the Chef's Table cannot be yours alone. After a welcome glass of sparkling wine, diners are treated to a five-course meal with each dish personally presented by the chef and with wine matched by a sommelier. Expect a dish such as a confit of Atlantic salmon and poached lobster tail to be followed by a petite duo of soups, then seared diver scallops paired with an Italian pinot grigio. Any doubts you have about this experience being worth the additional charge will likely disappear more quickly than the culinary delights on your plate. Giovanni's Table (Deck 6); US$35 per person for dinner; US$17 per person for lunch; US$10 per child for lunch and dinner: Traditional Italian food is served family-style at this specialty Italian restaurant which offers a traditional five-course menu. Of course, you aren't obliged to order every course but with dishes such as antipasti or a classic tomato and bocconcini salad, rich mushroom risotto, veal ossobuco and chicken breast filled with ricotta and mushroom and wrapped in prosciutto, it's a tempting prospect. With sharing encouraged by the friendly waiters, it is especially enjoyable to dine here as a group so everyone can try the different dishes. Desserts such as cannoli, tiramisu and rich chocolate cake arrive on a trolley, so passengers can choose the dish they like the look of best. Open on select sea days for lunch, and daily for dinner. Chops Grille (Deck 6); US$41 per person for dinner; US$26 per person for lunch; US$10 per child for lunch and dinner: The dark woods and refined atmosphere at this impressive steak restaurant make it the perfect choice for a romantic night out. Start with a crispy goat cheese salad or pan-roasted jumbo scallops served with bacon, onion, apple and hot mustard jus. Main meals include a juicy filet mignon with your choice of sauce, or an Asian-inspired crusted tuna served with sauteed bok choy. Sides such as truffled corn and creamy mashed potato are a highlight. Leave room for one of the excellent desserts such as New York cheesecake or a lush red velvet cake. Chops Grille also offers a less extensive selection of starters, entrees and sides, as well as two dessert options for lunch. Open select sea days for lunch, and daily for dinner. Izumi (Deck 11); a la carte: This Japanese restaurant is tucked away near the rear of the ship. The menu is split into starters, salads, carpaccio, soups and noodles, nigiri/sashimi, signature rolls, hot rock/ishiyaki and desserts. Prices range from US$2 for miso soup and US$9 for five pieces of sashimi, to US$18 for a mixed seafood hot rock platter. The wine list has different sake options plus a range of Asian beers. Open for lunch on sea days, and for dinner daily. Samba Grill (Deck 12); US$30 for dinner; US$10 per child for dinner: Decked out in jaunty red, maroon and gold, Samba Grill attempts to bring the popular South American churrascaria concept to the high seas. This dining experience revolves around meat, and lots of it, plus a buffet of antipasto and salads where you can help yourself to appetizers. However, you're better off saving yourself for a couple of the cute little cheese breads, which are a much-loved traditional Brazilian snack. Throughout the meal, "gauchos" (servers) circulate with pre-sliced pieces of sirloin, filet mignon, ribs, sausages, pork loin, shrimp, salmon, and other meats and seafoods on a skewer and slide a piece onto your plate on request. Open for dinner only. Ordering is handled by a red and green sign on the table. If you want more meat, switch this to green or you can leave it on red while you take a break. Unless you have a truly mighty appetite, there's usually way too much food on offer, even without the small side order of chips and grilled vegetables which is brought to the table. While there is no disputing the value, we would have preferred smaller portions sliced table-side so we could try a little of everything. Desserts include a small selection of delicious classics such as melting chocolate cake, but we challenge you to fit them in. Open for dinner daily for dinner.